After the Holy Prophet Muhammad (S.A.W.) Hadrat Usman Ghani (R.A.A.) was the third caliph of the Messanger of Allah (S.A.W.) His period was the period of extention and expansion in the history of Islam. This spirit was reflected from the writing letters. These letters generally pertain to four departments which may be found in this work. After the Holy Prophet Muhammad (SAW.) Hadrat Usman Ghani (RAA) is the third Caliph (Successor) of the Messenger of Allah (SAW.) He was elected as rightly guided Caliph after the great Caliph Umar Farooq (RAA). Certainly I consider it a great privilege, honour, and good luck, to translate the letters and despatches of such an august and revered personality, the third Caliph Usman Ghani (RAA). I have already completed the translation of the official letters and despatches of the first Caliph of the Messenger of Allah- Hadrat Abu Bakr Siddique, (RAA) which have been published the series of the letters of the Holy Prophet (SAW.) in English. Now this is the third book of the series, containing the letters of the third Caliph in Islam. Compilation and translation of the letters of other Caliphs is in hand. I have tried my best to translate the letters, official despatches of the third Caliph of Islam as faithfully as possible, and avoided the deviation from the original text. While translating the above mentioned documents, many difficulties came in my way. For example, several versions of a single letter were found in many books - some of them were quoted very briefly, some moderately and some as detailed as possible. In fact, due to the scarcity of paper in those days, letters were .addressed in a very brief style, simultaneously briefing the person who was to deliver the despatch to the addressee - thus lacking many details and leaving lacunas to be completed in personal touch while delivering the same in person. I have tried to select usually those letters, despatches that are fairly detailed and authentic and simultaneously comprehensive. Only those letters, have been included that give pretty piece of information and present something new. Now a few words about the style of the letters. The letters written under the name of the Holy Prophet Muhammad (S.A.W.) are matchless in quality and style. They are the utterances of the Messenger of Allah and the last model of authenticity, truthfulness, sincerity and exemplary mode of iblaagh (Preaching), bringing home to the reader the Message of Allah, presenting Islam in its pristine purity and appeals to the heart direct, thus preparing the head and the heart to motivate in the right direction. They are generally addressed to the different rulers of the then known world, and the many tribal chiefs of Arabia. The letters written by the First Caliph of the Prophet of Allah (S.A.W.) are also pithy, brief and to the point. They are written in a simple, factual, realistic and forceful style, avoiding superfluity. Generally, these letters are administrative in nature, written on account of political expediency and to carry the mission entrusted to Hadrat Abu Bakr (R.A.A.). His was the most critical period in the history of Islam. He had to deal with an iron hand and firm determination the three anti-forces working against Islam - withholding payment of Zakat, apostasy movement in Arabia and the false claimants to prophet hood. "O people! I have been elected as your Ameer (Chief) and Wali (Administrator) but I am not in any way superior to you. If I act in the right direction, help me, but if I deviate, put me to the right path." Almighty Allah helped the first caliph of Islam to stabilize the infant Muslim State wit h its headquarters at Madina. He was possessed with iron-nerves though his heart was aglow with merciful disposition. From the writings of the first Caliph of Islam, it is crystal clear that he used to show greater resoluteness and determination according to the degree of danger and impending perils. Constant Company of the Prophet of Allah (S.A.W.) and consequent love for Islam engendered in him wonderful power of confidence, amounting to certitude, equanimity of conduct, excellence of character and forbearnace as reflected from his writings. So this is the period of consolidation and cementing the centrifugal forces bent upon to destroy the infant Muslim State. The work was accomplished by the first caliph of the Messenger of Allah (S.A. W.). During the days of the Second Caliph of Islam, Hadrat Umar Farooq (R.A.A. ), (13 -23 A.H.) the Muslims were in a position to conquer Syria, Iraq, Faris and other far off distant lands. It was the period of conquest based upon the work of the First Caliph - the consolidation and unification. This is seen from the letters and despatches of the Second Caliph in Islam. No doubt, Umar Farooq (R.A.A.) was a great administrator and his letters indicate political acumen, foresight and truthfulness of disposition in all dealings. In fact only the gist of the letters could be preserved in those times due to scarcity of paper and pre-occupation of the Caliphs of Islam. In Muharram 24 A.H. Usman Ghani (R.A.A.) assumed the charge of the third rightful Caliph of Islam after his due election in the manner prescribed by the Second Caliph of Islam, Umar Farooq (R.A.A.). It is the period of expansion, peace and prosperity in the history of the Islamic world. A powerful Islamic government was established in Egypt, Syria, Iraq, Jabbal, Faras, Sajistan and Kirman having a number of military cantonments. The subdued nations paid fixed Kharaj and Jiziya. Those who participated in the early campaigns of Islam were provided cash pay, ration and a large number received also stipends amounting to two and a half thousand rupees annually. Thus each individual in Madina, right from the old to the child was getting pay, ration, stipends. The prospects of commerce became bright as new vistas were opened. Trade and merchandise found free outlet among the Arabs specially the people in Madina. Commerce, acquisition of property and income through agriculture made them prosperous and affluent. The natural consequence of opulence, plenty and leisure was the re-emergence of the old Arab tribal and racial jealousies that lay buried among them due to deployment in jehad, common dangers and poverty. 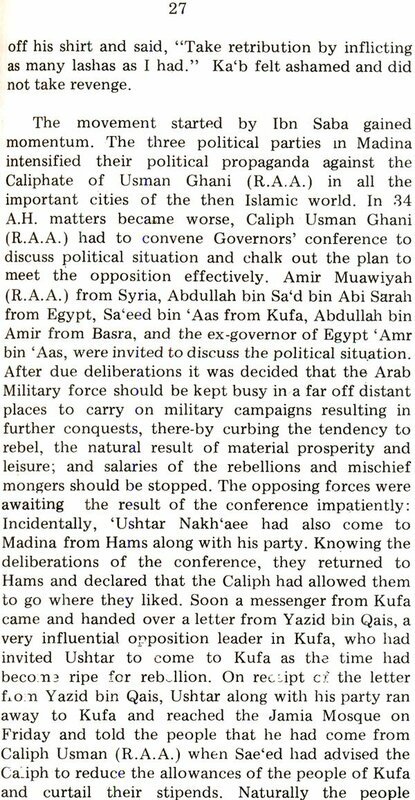 It is under this perspective we find that there were four political groups in Madina at that time. (1) Government party-the group of Hadrat Usman Ghani (R.A.A. ), comprising the majority of Ummaayyads. (4) Group of Zubair bin Awwam (R.A.A.). The last three made a united front against the then existing govermment party whose aim was to overthrow the established lawful Caliphate of Usman Ghani (R.A.A.). Their sole aim was to criticize the activities and lawful actions of Usman Ghani (R.A.A.). On one occasion Usman Ghani (R.A.A.) remarked: "By God! You condemn and abuse me on account of such actions which were gladly accepted and appreciated by you during the days of Ibn Khattab (Umar Farooq R.A.A.). The truth of the matter is that the second Caliph (R.A.A.) kicked and down trodden you under his feet, used his hand and took good care of you through the force of his tongue to keep you straight and tight. So, willy nilly, you remained subservient and showed obedience: on the other hand, I showed softness, humble disposition; neither did I raise my hand on you nor abused you, so you became unduly courageous and insolent. (Ansaabul Anshraf 9/5). "In the nam Be it clear that I have appointed Abu Musa Ash'ari as governor of Kufa, the man of your choice and removed Sareed bin 'Aas from his office. By God! I will persistently lay my honour before you, observe patience, try to make peace with you; so you may continue, unhesitatingly, to place your demands before me. I will abide by them as long as God's limits are not transgressed. I do not want that you may be able to find a pretext to disobey me." It is down right criminal to abuse or offer invectives to the Caliph. Whosoever is guilty of the crime, will be automatically put to humiliation and disgust. It has come to my notice that you have degraded my officer and 'aamil (Saeed bin 'Aas). You must remember that the excesses committed by you will recoil over your own heads. You have opened the gateway of Divine wrath and chastizement, dragged the public into the toil and turmoil; shook off the yoke of fealty and allegiance to the Caliph in Islam-the successer of the Messenger of Allah (S.A.W.) -- the unifying force in Islam. You are the first in my subjects who oppose me, created dissensions and deviated from my obedience those who oppose me subsequently and turn disobedient, its onus will lie over your shoulders and will recoil over your own heads. Fear Almighty Allah from Whom you have Turned away, repent for your misconduct. (Futuhlbn 'Asim Kufi, p. - 319/320). In short, the third Caliph of Islam, 'Usman Ghani (R.A.A.) sacrificed his life for the unity and solidarity in Islam. This is the highest form of martyrdom though humble, shy almost bashful, with lenient disposition but remained like a firm rock not to put off the mantle of Caliphate at any cost even at the cost of his life. He knew with certitude that the rebels will not spare his life but with perfect equanimity of behaviour and calmness, he received martyrdom with open arms rather than to behave otherwise. He was the very embodiment representing unity and solidarity in Islam. He would not abdicate or accept deposition. Subsequent events proved that Imam Hasan (R.A.A.) abdicated in favour of Amir Muawiyah (R.A.A. ), to pacify the contending parties for the preservation of the centre in Islam. But in spite of this Hadrat Hasan (R.A.A.) saved the centre in Islam through abdication, othe wise forty thousand Muslim soldiers were ready to fight for him. History of Islam till to-day is a story of quick succession of depositions and abdications started. The disssensions could not be bridged so far. Successive rulers deviated from the right path of the true following of the Messenger of Allah (S.A.W.). Thus Islam became foreign in the very place of its birth. The headquarter of Islam was shifted from Madina to Kufa, from Kufa to Damascus, from Damascus to Baghdad, from Baghded to Cairo and from Cairo to Istanbul. Finally the institution of the representation of Islam - the rightful Caliph in Islam was abolished in 1924. It was the height of weakness that the Muslims deviated so much from the right path that the very root was cut off - the main trunk on which the solid structure of Muslim Society could be broad based. Since then, there is no end to the difficulties encountered by the Muslim rulers and people and there is no practical solution except the revival of the instituion of Centre based on real Islam - the sign of integration, solidarity and consolidation in Islam. Can the Muslims unite without a Centre? The simple reply in the form of a counter question: Can we draw a circle without a centre? It was this high ideal - the instituion of Caliphate for which Hadrat Usman presented his life in the form of martyrdom - the highest evidence to live for truth at the cost of his life. It is the duty of the present day Muslims to revive this institution if they desire to live as a force to be reckoned with. To sum up, from the letters of the Third Caliph in Islam- 'Usman Ghani (R.A.A. ), it is evident that though lenient in disposition and bashful in nature, he could live upto the ideal not to put off the mantle of Khilafat placed upon his person as the Rightful Caliph of the Messenger of Allah (S.A.W.). This is the main unifying force in Islam. We must pray to Almighty Allah that the Muslims be blessed with a personality of integrated mind who could unify the disintegrated Muslim world of to-day. So we must work upto the idealistic mission of Usman Ghani (R.A.A.) and prepare the Muslim Society on this idealistic mission for which the Third Caliph in Islam gave his life and practically demonstrated his life-mission in action -- the Martyrdom. Let us arise and do the needul. Our actions are dependent upon the guidance of Allah. Ameen!